Great Sankey Neighbourhood Hub, Warrington, is seeking accreditation as the UK's first fully integrated dementia-friendly library and leisure building. The Hub is aiming to be the first public building to gain the University of Stirling’s Dementia Services Development Centre (DSDC) Gold Award for its dementia-friendly architecture, design and facilities. Great Sankey Neighbourhood Hub is an integrated facility. The building includes health, leisure and library facilities for the community. Thedesignconcept worked closely with everyone involved to produce designs that were kept close to the architect’s original vision for the space. Due to the hub being one of the first public wellbeing buildings seeking Dementia Friendly accreditation, we researched the best practice for designing dementia-friendly environments with the aim of getting accreditation from the Stirling Dementia Services Development Centre. Cllr Tony Higgins, said: “The Great Sankey Neighbourhood Hub is a fantastic asset for the community, which will bring huge benefits to people of all ages, for many years to come. I’m delighted that phase one is complete, and that local people will soon be able to begin enjoying the hi-tech facilities. Working closely with Live Wire and Walker Simpson Architects, thedesignconcpet created bespoke furniture and chose specific fabrics to ensure the hub was specified for dementia users. The Hub’s leisure facilities include spa, gym, tennis courts and swimming pool. Phase 2 of the project is due to be completed summer 2018. 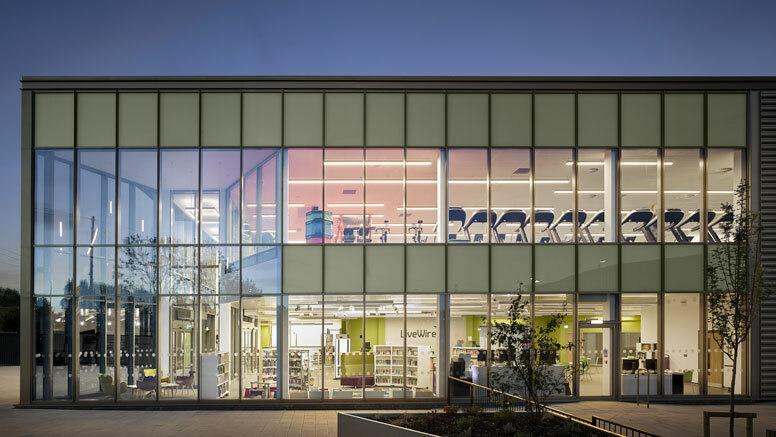 Great Sankey Neighbourhood Hub, Warrington, is believed to be the first fully integrated, dementia friendly wellbeing building and public library in the UK.